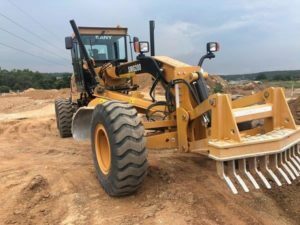 A word-of-mouth recommendation from a fellow satisfied SANY customer resulted in roads contractor Obzza Construction approaching the Nelspruit branch of Goscor Earth Moving (GEM) for all of its equipment needs for a major contract in the area. GEM Nelspruit has been practicing under the multi-franchise Goscor Industrial & Construction Equipment umbrella as of 1 January. So impressed was owner Obert Shikane that he has acquired three SANY machines to date, namely a SY210 excavator, a SMG200 grader, and a STR roller. The equipment is currently undertaking a variety of tasks on the road project, from site clearance to general excavating work. Shikane reveals that he was referred to GEM Nelspruit Branch Manager Jean Botha by a fellow contractor who had acquired SANY equipment, and who had subsequently been duly impressed by its durability and ruggedness, coupled with the aftermarket support and technical back-up offered. “What is really impressive is that GEM Nelspruit can quickly dispatch a technician to site in the event of any breakdown, in addition to having all necessary spares on hand for fast dispatch. This gives us peace of mind that we can meet the deadline of our own contract, especially given the arduous nature of the project,” Shikane comments. 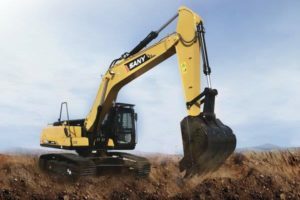 The SANY SY210 is a precision-engineered hydraulic excavator, boasting industry-leading technology for maximum job-site productivity. Features include the latest emissions-compliant Cummins engine, high operating efficiency, a 10% reduction in fuel consumption, and reliable, top-quality components. The SANY SMG200 is a 200 hp mechanical grader with a rated power of 164 kW, featuring a mechanical drive, stepless speed change, and simplified operation. The direct-drive powershift transmission delivers smooth, responsive shifting, while the Cummins engine and Bosch fuel injection ensure reduced emissions. The SANY STR series of tandem drum rollers feature industry-leading vibration drum technology for maximum evenness, smoothness, and compaction, in accordance with the strict requirements of highway surface work. The power system is ideal for sloping work sites, while the sprinkler system allows for 5.7 hours of work on a single intake.